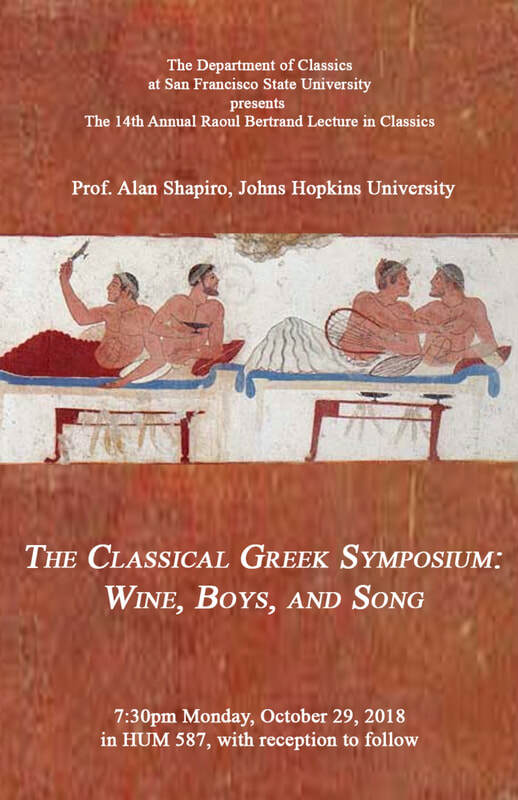 Hosted by the Ancient Greek Reading Group in San Francisco. The group page is here. Dr. Alexandra Pappas, Associate Professor and Raoul Bertrand Chair in Classics at San Francisco State University, will talk about her ongoing work with the Medea Project: Theater for Incarcerated Women/HIV Circle and about teaching Classical Mythology in the San Francisco County Jail. She will present in collaboration with Felirene Bongolan, dramaturge for the Medea Project; Deborah King, longtime core member of the company; and Lisa Frias, choreographer and core member. With a methodology developed by its Director, Rhodessa Jones, the Medea Project draws on Greco-Roman myths to ground the theatrical performances of women's personal experiences of trauma, incarceration, and illness for healing purposes. For more on the Medea Project, see the Medea Project Facebook Page. Denali St. Amand, the Latin Professor from Cerro Coso Community College in Ridgecrest has been teaching Latin to inmates with amazing results. Working with 58 students, she teaches at two prisons: the California City Correctional Facility and the Tehachapi California Correctional Institution. Denali will talk about how Latin is transforming the lives of those in carcere. Hear from the director of the country's leading residential self-help organization for substance abusers, ex-convicts, and homeless. The average resident has been a hard-core drug addict for sixteen years, abusing alcohol and multiple drugs and has dropped out of school at the 7th grade and has been institutionalized several times. Many have been gang members; most have been trapped in poverty for several generations. Delancey Street is run with no staff and no funding. Like a large family, the residents must learn to develop their strengths and help each other. It’s an approach to changing lives that is “against all odds”. They have organized 250 people who had never worked and had no skills and have taught them to build a 400,000 square foot complex as their new home on the waterfront, where we will be dining. ​ Check out the Delancey Street Foundation Website. Valet Parking available for $4. There is also metered street parking. EMAIL YOUR CHOICE BY MARCH 11 to Gillian McIntosh. All terms are for two years. Our current VP does not wish to become President, so we have opened up the position to anyone who has been on the board for two years. ​Detailed itineraries, tour descriptions, applications, and information on abundant scholarship opportunities can be found on the Vergilian Society website. Join us for Lunch and a Lecture with Assistant Professor Colin Webster from UC Davis. In explaining the inner workings of the body, the Hippocratic author of Diseases 4 uses multiple analogies. Many of these derive from devices that a physician would have encountered in the quotidian practice of medicine (e.g., cupping glasses, boiling liquids, interconnected bronze dishes, oil-flasks, inverted amphorae, etc.). In other words, the technologies used by this Hippocratic author to intervene in the body and treat its ailments can sometimes merge into explanations of those same processes. Through textual, visual and archaeological evidence, this talk focuses on the role that physical implements play in both the theoretical and practical apparatuses of medicine, examining what might be called “prosthetic cognition.” It illustrates how the tools that act upon the body’s exterior can be projected into the body’s interior, with the result that tools for doing transform into tools for thinking. Food & Drink are included in the cost of admission. November 30th & December 1st at 7.30pm: Semi-Staged Performances. Click here to buy tickets. CCA-North Member John Klopacz is seeing the show on the 1st if you want to join him. There is a discount code CCANORTH which offers a 10% discount of gold and silver seats. The theme is FROM HADES TO The HEAVENS; The Power of Myth and Image. Mythology is always a popular subject! It is FREE (except for purchase of one's own lunch) due to generous donors. It includes 2 talks on mythological images in Sappho, Dante, Disney, and more, plus a special Centennial Star tribute presented to the ACL President. There will be 3 docent tours of the new Underworld exhibit, as well as SALVI style Latin tours with handouts. 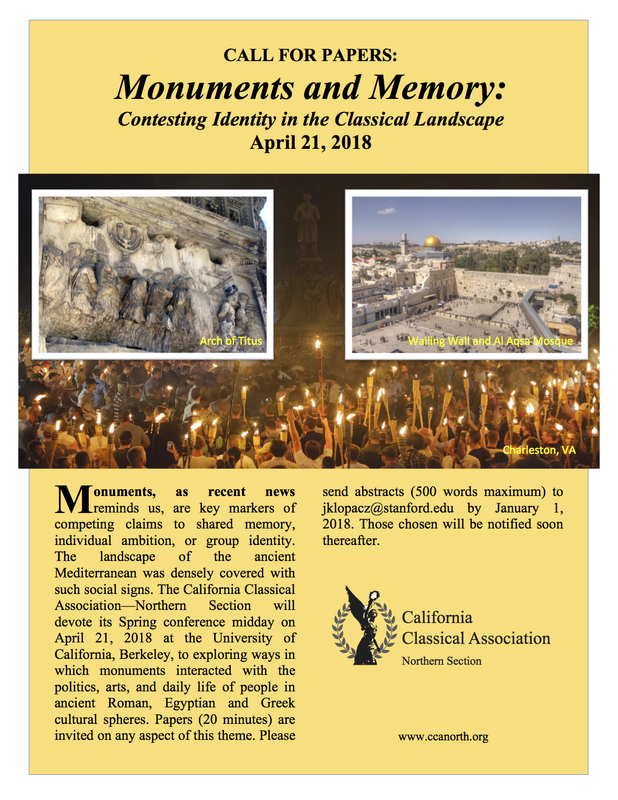 Come join the CCA North for our spring conference on Monuments and Memory. UC Berkeley is easily accessible via BART. For parking information, please see this website. Parker, Grant, Ph.D. Prof Classics, Stanford University. "What's the Use of Monuments?" Chapman, Honora Howell, PhD. Prof Classics, Cal State U Fresno. 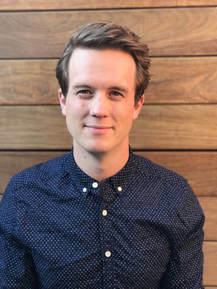 "Colossal Amnesia: Forgetting the Jewish Connection to Rome's Monuments and the Roman Connection to Jerusalem's Monuments"
Crosby, Daniel J. Grad student, Bryn Mawr College. "Remembering Quinctilius Varus: Memory and Memorialization of the Failed General in the Annales of Tacitus"
Fascione, Sara. Grad student, Università degli Studi di Napoli Federico II and Université Jean Moulin Lyon 3. "Ad posteros monimenta: A School of Romanity in Third Century Gaul"
Gazzoli, Silvia. Grad student, Università degli Studi di Milano. "Vos qui legitis: Reconstructing the Identity of Roman Children through Funerary Monuments"
"Monuments for Memory: (Dis)playing Identities in the Classical Polis"
In the summer of 2018 (July 16-August 3), there will be an NEH Summer Seminar for pre-collegiate teachers on the topic of Roman Daily Life. This seminar is an opportunity to read Petronius and some graffiti in Latin and look at Pompeian archaeology for various topics of Roman daily life. The Petronius reading forms a central core of the seminar, and thus an intermediate level of Latin proficiency (1 year of college level Latin) is required. The seminar will be held in St. Peter, Minnesota (1 hour from Minneapolis) on the campus of Gustavus Adolphus College. The NEH pays each person $2700 to participate, which will more than cover the living and food expenses (approximately $1500) – note that each participant is responsible for their own travel expenses. The seminar has been organized by Matthew Panciera (Gustavus Adolphus College) and will be co-taught by him, Beth Severy-Hoven (Macalester), Jeremy Hartnett (Wabash), and Rebecca Benefiel (Washington and Lee). If you have any questions, please write me (Matthew Panciera), the director of the seminar, at panciera@gustavus.edu. College of William & Mary, Williamsburg, Virginia, April 19-21, 2018. The AAH seeks papers that raise broader issues and themes that will engage all AAH attendees regardless of their primary specialization. As always with the AAH, all sessions are plenary. Papers will be 20 minutes in length, with time for discussion. Please send abstracts (.pdf or .docx) of no more than 500 words to aahmeeting2018@gmail.com by Monday, December 4, 2017. Limited references may be provided in-text only; no bibliographies please. For more information, download the file below. equivalent terminal degree at the time of application. as soon as you can! When: Saturday 9 September, 5:30pm for dinner, 7:30pm for opera. Come meet Jason Pedicone, co-founder of Paideia, and learn what Paedeia can offer high school students, college students, classics graduates, classicists, and our community in general. They have a program for everyone. This is a chance to talk directly to the director Jason about programs, costs, and future possibilities. Also meet John Wonder from the Vergilian Society who will talk about their programs. 9:30-10:00: Registration and coffee and donuts. Eta Sigma Phi, Honorary Society for Classical Studies. 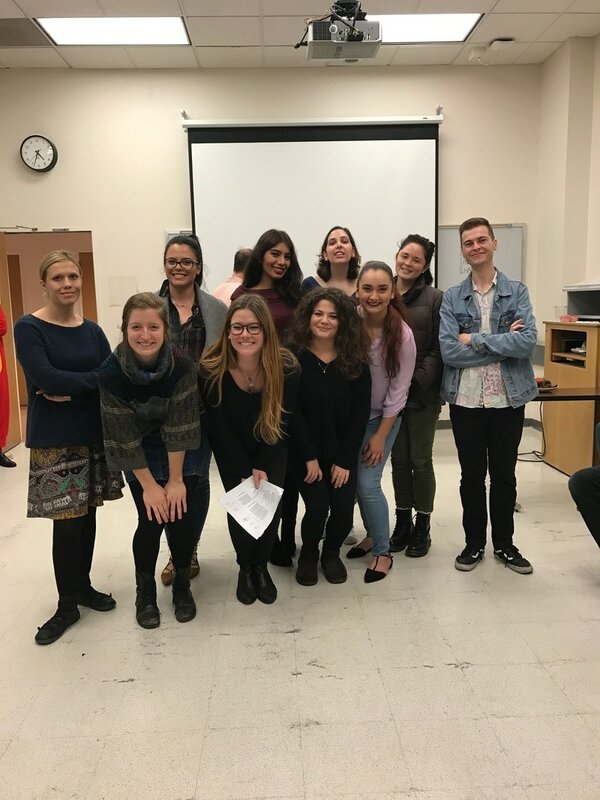 Now recognized as the Iota Phi Chapter of Eta Sigma Phi, SFSU just completed its third initiation ceremony in December 2016, welcoming 11 new members into the chapter, which totals 36 members in just three semesters as an active chapter. The Iota Phi Chapter consists of both undergraduates and graduates enrolled not only as Classics majors, but also as History, Philosophy, and Biology majors, who are passionate about the study of Latin and Greek. conference will examine ways in which movies, video gaming and other media can engage new audiences with the ancient past. A special focus will be on creative pedagogical uses of media (K-12 and college levels) for introducing the Classics. Donuts, coffee, and a light lunch are included in the price of tickets. available around the Stanford Oval. Amazon stories, evident in the recent attention given a 1940s comic-book heroine, Dr.
similarity between these pictures and the descriptions depicted in the Iliad of Homer? for teachers and for all interpreters of ancient texts. .Adrienne Mayor who is a Research Scholar in Classics and History and Philosophy of Science at Stanford University will be lecturing on "Amazons: Warrior Women in Myth, Art, and Archaeology"
with an introduction by Richard Martin. Click above for an event related to our spring meeting. CCA-N Members may purchase tickets for a 20% discount by using the code: VENICE. Check out the performance by clicking on the text above. San Diego, CA—The American Council on the Teaching of Foreign Languages (ACTFL) is pleased to announce the 2016 National Language Teacher of the Year has been awarded to Edward Zarrow, a Latin teacher at Westwood High School in Westwood, MA, and a member of the Northeast Conference on the Teaching of Foreign Languages (NECFTL). The award presentation was held during the Opening General Session of the 2015 ACTFL Convention & World Languages Expo in San Diego, CA. The award for the ACTFL National Language Teacher of the Year is intended to elevate the status of the language teaching profession at the state, regional, and national levels by creating opportunities for recognizing the most accomplished members of the profession. The Teacher of the Year becomes a spokesperson for the language profession in order to increase the visibility of the importance of learning languages and cultures to the general public. 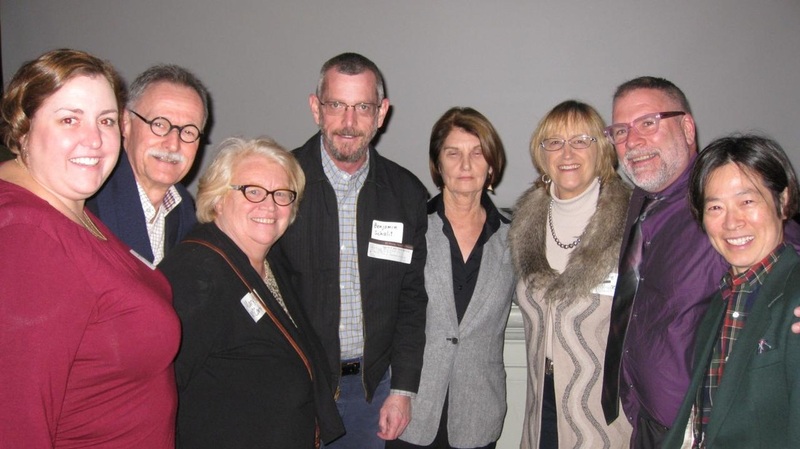 The California Classical Association, Northern Section, had a great conference at the San Francisco Legion of Honor, in conjunction with the exhibition Ancient Luxury and the Roman Silver Treasure from Berthouville (September 19, 2015 – January 10, 2016) Papers addressed luxury in the ancient Greek and Roman Culture. “Tragedy from Truphê: the destruction of ancient Sybaris in Greek and Roman thought." Les Troyens at SF Opera with discounts for CCA members. 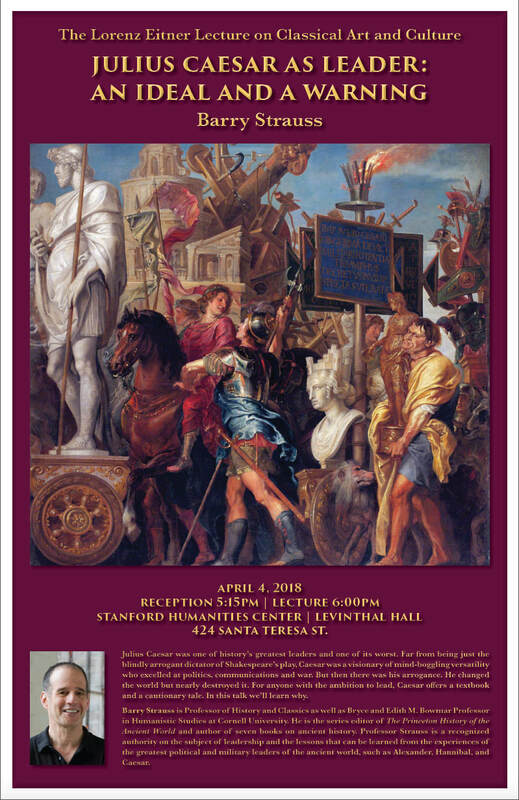 To prepare us for San Francisco Opera’s production of Berlioz’s Les Troyens (and because Vergil is our all-time favorite author) Mark Griffith (UC Berkeley) and Garth Tissol (Emory) will speak on the Trojan War and Aeneid, as seen in poetry and song. Garth Tissol: FROM EPIC TO TRAGEDY: The Aeneid becomes an opera. $25 per person; $10 for students; talks followed by wine/soda and cheese. Biennial CCA Board elections will also take place at this meeting. Richard Martin of Stanford University talked about the reception of The Odyssey over the centuries, and artist Alexandra Frank discussed her recent artwork inspired by The Odyssey and featured in her 2013 San Francisco show. A pleasant lunch outdoors on the beautiful Menlo School campus followed. This 2013s Fall conference featured two speakers on Tacitus: Christopher Krebs, of Stanford University, who talked about his award-winning book, A Most Dangerous Book: Tacitus's Germania from the Roman Empire to the Third Reich. Ancient historian Charles Hedrick of the University of California, Santa Cruz, also gave a presentation on Tacitus, "Tacitus' Memorious Histories." The talks were preceded by a continental breakfast and followed by a delicious lunch at the beautiful Menlo School Campus. 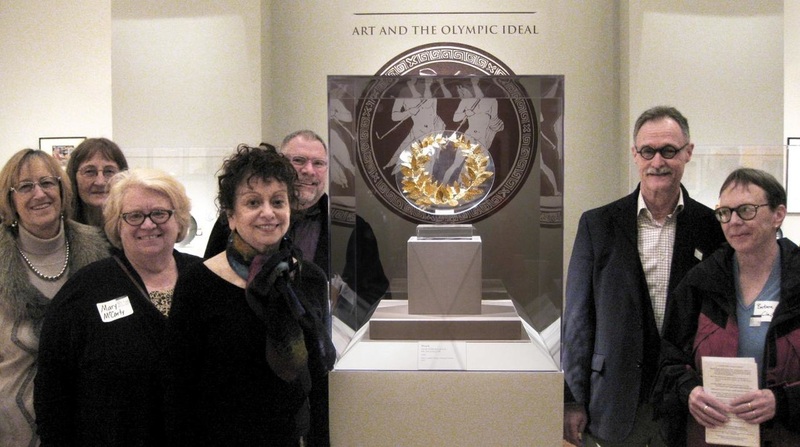 California Classical Association—Northern Section Spring Conference: "The Last Olympics Hurrah at the Museum"
For our Spring Conference, enjoyed a special showing of the exhibit by its curator, Renée Dreyfus, and a talk by Susan Stephens of Stanford University. To get a taste of Susan Stephens' talk, you can read this article about her thoughts on the Olympics at the Stanford University website. Direct from its acclaimed sold-out premiere in Los Angeles, this sweeping production of Elektra brought an exquisite new translation of the timeless Greek tragedy to the Bay Area. A feast of poetic language featuring haunting original music by Pulitzer Prize–winning composer David Lang, Elektra was directed by Carey Perloff and featured two of A.C.T.’s most beloved performers: core acting company member René Augesen in the title role and associate artist Olympia Dukakis as the Chorus Leader. Patrick Hunt, director of the Stanford University Alpine Archaeology Project. Since 1994, the Stanford University Alpine Archaeology Project has explored, excavated and conducted first-hand archaeological research in the Alps. In addition to ongoing excavation in the Grand-St. Bernard pass between Switzerland and Italy, at least every other year they have tracked Hannibal's passage through the Alps in 218 BCE with his army of men and elephants to the astonishment of the Romans. Using the accounts of Polybius and Livy as source texts, they attempt to match relict topography with both past eyewitness and reconstructed narratives. This continuing exploration is done mostly on foot hiking over several Alpine passes almost 10,000 ft. in elevation. To date they have hiked over twenty passes and mostly eliminated candidates for Hannibal's crossing while cementing the probability of a few passes for Hannibal's feat. Fresh perspectives on Caesar and his authorship to be followed by a open discussion with the topic, "CCA, Classics, and You".